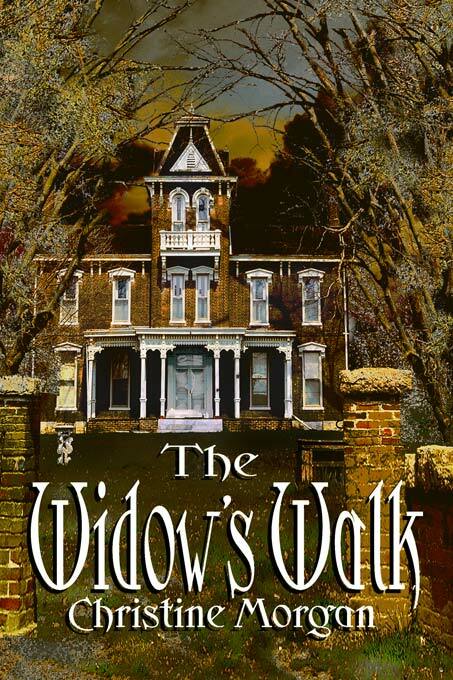 PUBLISHER: LACHESIS PUBLISHING – IS OFFERING A 25% DISCOUNT ON THE WIDOW’S WALK (PRINT OR E-BOOK) IN HONOUR OF “BLACK FRIDAY” JUST TYPE IN THE PROMO CODE RevolvingBook123111 WHEN YOU GET TO THE CHECK OUT. For a young married couple, Erin and Gil, the small coastal town of Blackwater Cove is many things. The seaside; their first home; the beginning of a wonderful new life together; Gil’s chance to work alongside his brother Colby on a fishing boat, a job he loves. Christine Morgan may seem normal enough on first glance, but she’s known to her daughter’s friends as the weird mother who throws birthday parties with themes like Fear Factor or Sweeney Todd, has medieval weapons hanging on the walls, and makes classroom visits to talk about writing scary stuff. Her interests include pirates, Vikings, zombies, superheroes, British comedy, action movies, making nut-people crafts, fantasy role-playing games, cartoons, and horror novels. She also works the overnight shift in a psychiatric facility, which may explain a lot. Half-asleep but with a smile on her face, Erin headed for the bathroom. She knew her way now well enough to do so in the dark, padding softly along the familiar hallway. The door to her office stood open, the room beyond a silent blackness but for the tiny varicolored lights and muted electronic hums of dozing computer equipment. The spare room’s door was shut. The rest of the house was still. But it didn’t feel empty. Which was silly. Of course it wasn’t empty. Gil was home. A nice hot shower had revived him and eased most of his aches long enough for them to enjoy dinner. He’d raved about the chicken, admitted that the gravy did have a hint of a burnt-dog-hair zing to it, and polished off two big pieces of cake along with most of the bottle of wine. They had taken the candles up to their bedroom and made love in their delicate flickering glow. The poor guy had conked out thirty seconds after they finished, and now slept like a stone. He wasn’t snoring, wasn’t tossing and turning, wasn’t moving at all. He hadn’t even been able to pull up the covers. Erin had done it for him. She used the toilet, washed her hands and face, drank a glass of water, and had just switched off the bathroom light again when she heard a sound overhead. It sounded like a voice. A low, stifled moan. Erin paused, with her hand still at the switch. She held her breath. Tensed. Poised. Listening. Then she heard the creaking give of a board. A thump. Like a footfall? She looked up, as if she possessed X-Ray vision and could see through solid walls. But all she saw was blank ceiling, lit only by the soft ambient moonlight through the bathroom window. Raccoon. Raccoon in the attic. When she’d gone up there with Noah, though, she had not seen anything to indicate that raccoons frequented the attic, or any way for them to get up there in the first place. No holes they could squeeze through. No food. Nothing to make nests with. Did raccoons even make nests? Was she thinking of rats? There weren’t rats in the attic, either. Just that one old trap, untouched, the cheese used to bait it having long since crumbled to powder. No rats, no mice, no bats, no owls. Not even any spiders that she had seen. A few cobwebs, but old and wispy and nearly intangible. Nothing lived in the attic. But, if nothing lived in the attic, and the night wasn’t windy enough to get the weathervane swinging and squeaking on the roof or the branches of the old oak scraping against the siding, what had made the noise? She told herself to march right on up there and take a look. After all, it wasn’t like there was anything to be afraid of. Gil was just down the hall. And, really, you’d think that if she was going to be frightened by weird spooky noises in the night, it would have happened while he was away. She had been all alone in the house. If ever there’d been an optimum time for a ghost to make an appearance, it would have been then. But had she heard anything? Had she felt anything? Now, though, her lungs pounded from holding her breath and her eyes bulged and dried out because she didn’t want to blink. Her skin was one big puckered sheet of gooseflesh. Her ears hurt from listening so hard. Another thump. Definitely sounded like a footstep. A stealthy footstep. Go back to the bedroom and wake up Gil? She couldn’t do that. He needed his rest. She didn’t have the heart to wake him, especially for no good reason.